Various locations throughout London, available on their web site. Noodles of any kind are my weakness. And Asian noodles have been my downfall more than once. 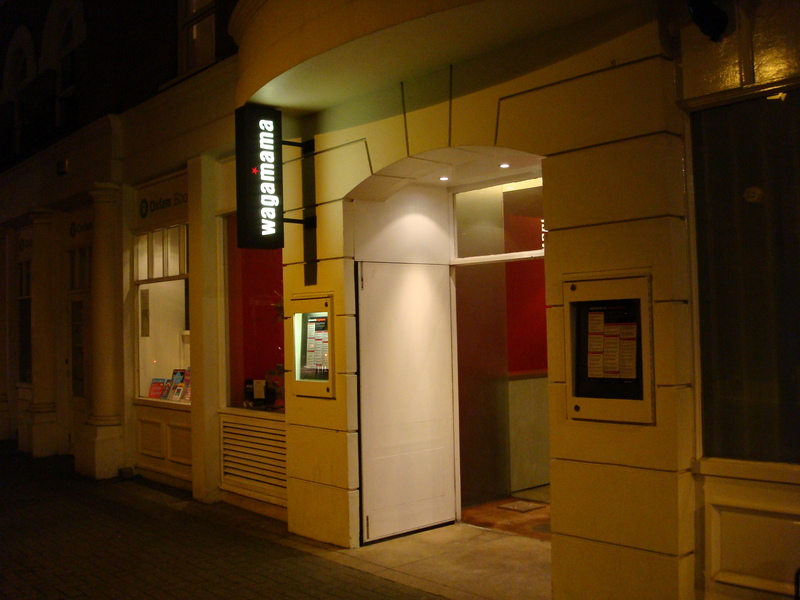 Ever since I started passing through London, I eat ramen or udon at one of these restaurants. The one I usually go to is located in Bloomsbury near the British Museum. On this most recent trip, I discovered to my great joy that the new Terminal 5 at Heathrow has a Wagamama. Whichever one you enter, you’ll find a very urban hip wait staff — unnaturally colored hair, bared-midriffs, tatoos, edgy t-shirts — who scribble your order on your paper placemats on the long, picnic-table style tables so they can deliver your bowls of steaming soup or plate of pan-fried noodles to you and not your neighbor. In whatever form you ingest them, the noodles here are always good.